The Holistic Health Practitioner Program is a 500 hour program that allows students to explore multiple areas of holistic health. Using proven, ancient medicine students will gain a broad knowledge of different holistic modalities including Ayurveda, Aromatherapy, Herbal Medicine and Homeopathy. Upon completion of the 5 modules, students will be eligible for Board Certification through the American Association of Drugless Practitioners as a Holistic Health Practitioner. OM Wellness Institute is pleased to announce that we are accepting applications for our Holistic Health Practitioner Certification course. The Holistic Health Practitioner Certification is a flexible program with an open enrollment. You have 2 years to complete the course, but many of our students complete in as little as 12 months. Start at anytime! 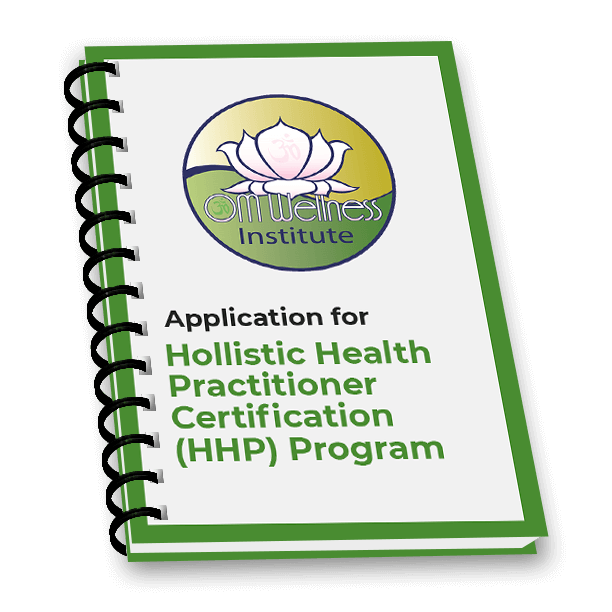 The Holistic Health Practitioner Certification is comprised of 5 separate modules. Each module covers a specific modality and will require correspondence, work and quizzes/tests. All assignments and projects require a passing grade in order to move on to the next module. The Specialization Project will be an opportunity for students to focus on a specific area such as: Herbology, Ayurveda, Aromatherapy and/or Whole Food Nutrition. This is an opportunity for students to specialize their individual interest. To maintain your OM Wellness Institute Holistic Health Practitioner Certification you will need to take 10 hours of CEU credits from one of our approved schools Approved Affiliate Schools annually.